I stumbled across Joe’s New York Pizza on my lunch from work a few weeks back, it is located on Las Vegas Blvd in front of the Premium Outlets. When you walk in it is a small pizza joint and you walk up to the case of pizzas on display and order by the slice for their no delay lunch. They do have other menu options like whole pizzas, salads, calzones, subs & pastas. Once you pick out your slice or slices they will put them in their rotating oven and warm them up. 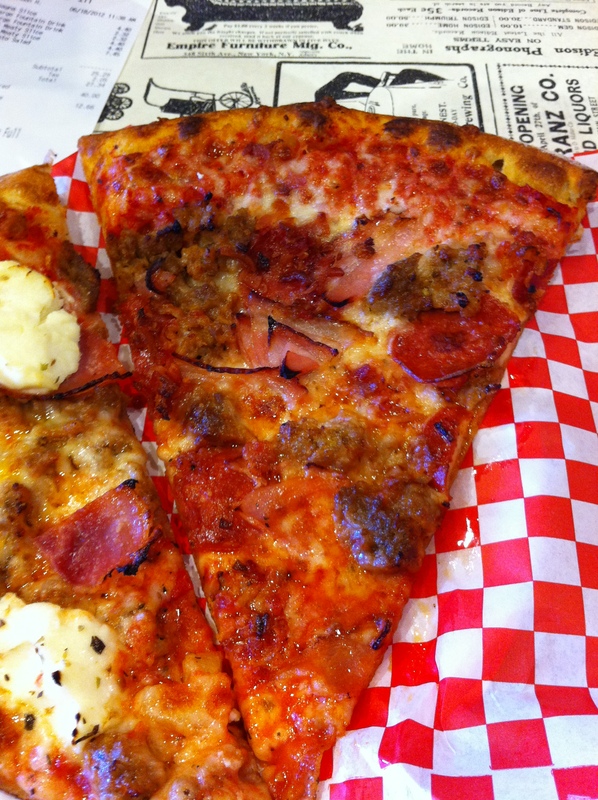 The choices of pizza seem to change per visit so you can always get something different. On this trip I ordered their lasagna pizza and the super meaty, their pizzas are mainly served on a thin crust, but there are a couple that do have a thicker crust. The slice on the left is the lasagna slice. The lasagna pizza is ricotta, ham, sausage, meatballs, mozzarella, parmesan & oregano. 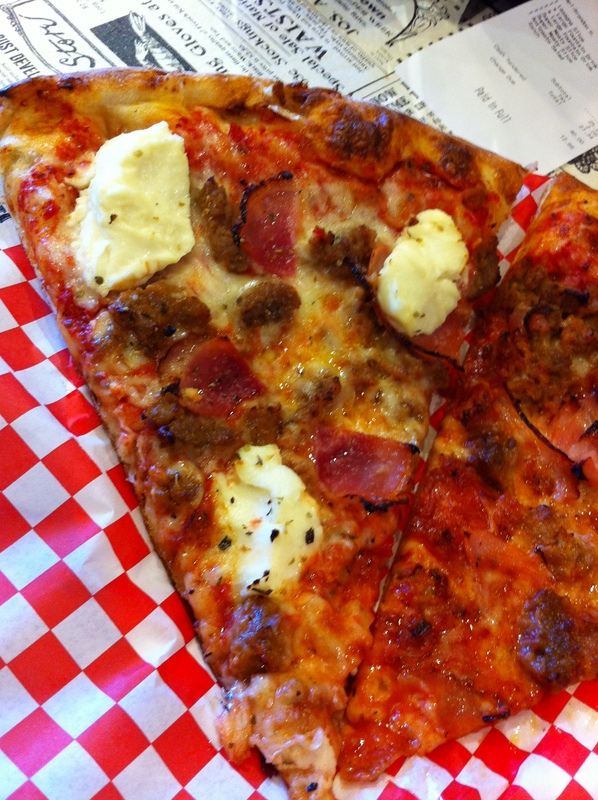 I really liked this pizza the ricotta was perfectly smooth and added a lovely flavor to the meats & mozzarella cheese. I personally took off a piece of the crust and spread the ricotta around so that I got a little bit in each bite because it worked so well with this pizza. My only complaint is that I think it could have used an extra turn or two through the oven, to be hotter, it was warm but needed more heat. I would not hesitate to order this slice again if it’s on display on my next visit. The super meaty on the right is pepperoni, sausage, ham, meatball, topped with bacon & mozzarella. This was another good pizza all the meats work well together but it did need more cheese. The sauce had great flavor and the crust is nice and crispy and it too has great flavor, kind of salty & sweet which works well with all the toppings. This slice could’ve used another turn through the oven too and it would’ve been perfect. Next up we have the antipasto salad. 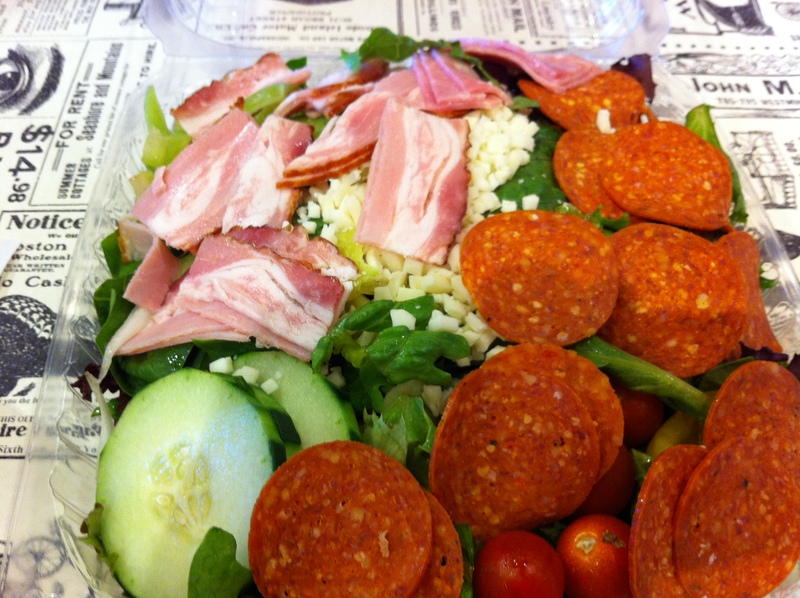 The antipasto salad is made of field greens, tomato, cucumber, red onion, green pepper, mozzarella, pepperoni, ham & croutons. You get a nice size salad, the only thing that would’ve made it a better was that instead of pepperoni it was salami. But over all this was a very filling salad and could easily be shared between two people and then get a slice of pizza and make a nice quick lunch. If you are in the area and looking for a good slice of pizza this is a great place to stop at. Our bill came to $27.34 w/tax. This was for three people and we got three slices of pizza, the salad and 2 large drinks, so for me the prices are really reasonable for a lunch meal that is quick and satisfying.